This body sculpting gel has been scientifically developed to assist in firming and conditioning skin, as well as in improving the appearance of uneven skin texture such on the hips, thighs, buttocks, tummy and arms. Skin is left looking and feeling smoother and more radiantly resilient. Assists in firming your skin texture, leaving it looking more supple and youthful. Helps to refine the appearance of your skin tone. Assists in gently moisturising your skin, giving it a softer, silky appearance. 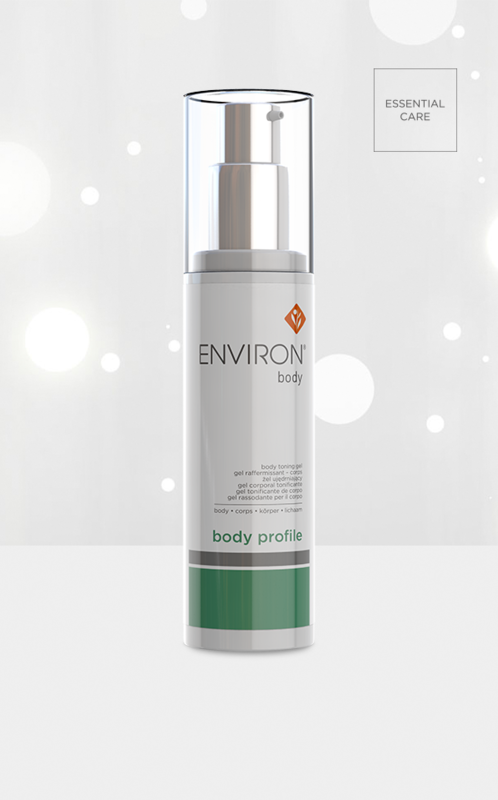 To optimise efficacy, use Body Profile in conjunction with Environ’s Electro-Sonic DF Mobile Skin Care Device which will assist to deliver more essential nutrients to where the skin needs them most. Increase circulation by first using a body loofa or scrub. Apply liberally to focus areas after a shower or bath, morning and evening. Can be used in conjunction with Environ Cosmetic Roll-CIT®/Cosmetic Body Roll-CIT®. For added effect, use with either Derma-Lac Lotion, Vitamin A, C & E Oil, Vitamin A, C & E Enhanced Oil, or Vitamin A, C & E Body Cream. A lightly fragranced, non-greasy hand and nail cream containing vitamin B5 and vitamin E that assist in protecting the skin from moisture loss by providing it with essential nourishment and the perfect moisture balance to leave hands and nails looking healthy. This light, easy-to-apply lotion helps to energise dull and tired looking skin as it contains several essential ingredients known for their effective moisturising properties. Skin is left feeling soft and smooth and looking beautifully healthy. This luxurious, easy-to-apply vitamin enriched body moisturiser containing a high concentration of vitamin A, vitamin C and antioxidants assists in rehydrating dry skin and improving its overall appearance and texture. A light, nourishing oil containing vitamins A, C and E and essential antioxidants assists in conditioning the skin and in improving the appearance of fine lines and uneven skin tone, leaving skin glowing with a healthy radiance. A light, nourishing oil containing high levels of vitamins A, C and E, essential antioxidants and Rosemary extracts assists in conditioning the skin and in improving the appearance of fine lines and uneven skin tone, leaving skin glowing with a healthy radiance.